Art can come in any size, shape or form, right? Sisters, authors and artists Donne and Ginny Geer knew that, and have mastered the technique of this new type of art. What is it? Take a look! If you are wondering how we came across these talented individuals, it was Beautifully Disney merchandiser Lisa Bergman who had that special eye for finding them. An avid reader of their blog, she soon discovered their salon just around the corner in Long Beach. Lisa constantly raved about this unique duo and couldn’t wait to see what they would do next. Drawing inspiration from fabrics, fashions, nature, moods, etc … the question soon became, if we gave you color choices from our two Beautifully Disney collections, Wickedly Beautiful and Unlock the Spell, what could you do? Well, we just found out and you are the very first to see it. So how can you create a similar look with your own Beautifully Disney collection at home? 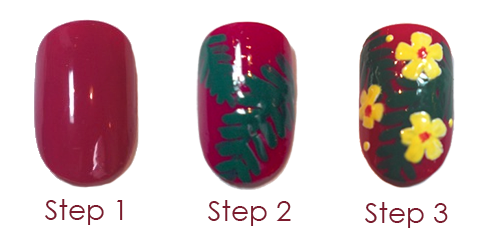 Here are a few easy steps from Donne and Ginny, using colors from the new Unlock the Spell collection. Step 1 : Begin by polishing all your fingers with 2 coats of Let Your Hair Down. Wait until they are completely dry before moving on to the next step. Step 2: Place a few drops of Beautiful Bayou onto aluminum foil. Dip your paintbrush into the polish and make one curved line across the nail to establish the middle piece of the palm frond. Make wispy lines by swiping the tip of the brush toward the line you previously painted. Fill in remaining areas of the nail with another palm frond. Step 3: To paint the yellow flowers, begin by dropping some Beautifully Disney polish in Provincial Mademoiselle onto the foil. Use a dotting tool (or something with a fine tip) to make 3 dots in a half circle. Fill in the rest of the circle with 2 dots to complete the petals. Use the paintbrush to make the flower petals more angular. Complete each flower with a dot of Let Your Hair Down. Use your dotting tool to place a few yellow dots around the nail. 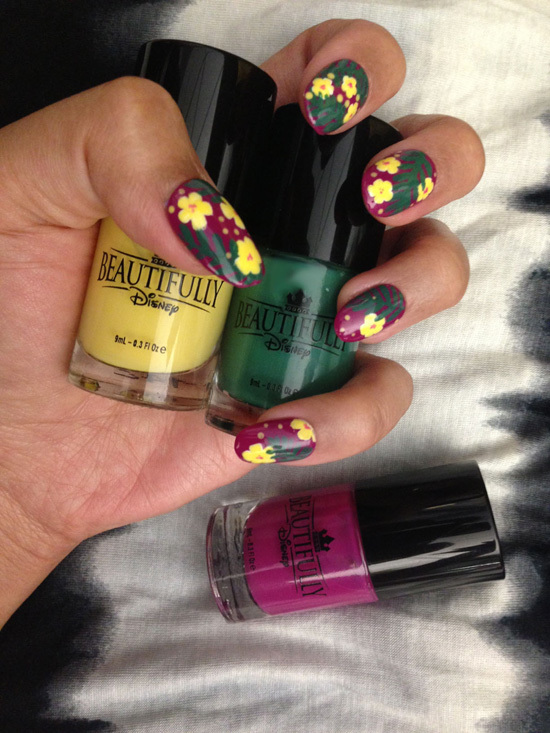 Add a layer of fast drying topcoat and you’re set! If you like these, then be sure to check out some of their other amazing nail “art” designs in their new book, titled Nail Candy, which features over 50 ideas for totally cool nails. Next step … I think I need to book an appointment to get my nails done by these two, don’t you? My friend Julie did it, which you can see here. Are you up for it, Erin Glover?